These warm and comfy socks are made in Scandinavian-inspired colours by Elizabeth Davis De Herraiz and are perfect for keeping your toes cosy when it’s frosty outside! Fancy your own pair? Get hooking with this fabulous pattern project in issue 96 of Inside Crochet, available to order online and download directly to your smart device. 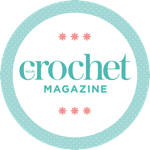 Elisabeth is a crochet addict hoping to pass on her passion and inspire crocheters to pick up their hooks and get lost in the stitches. Read her blog at www.elizyart.blogspot.com.